You are currently browsing the category archive for the ‘science’ category. 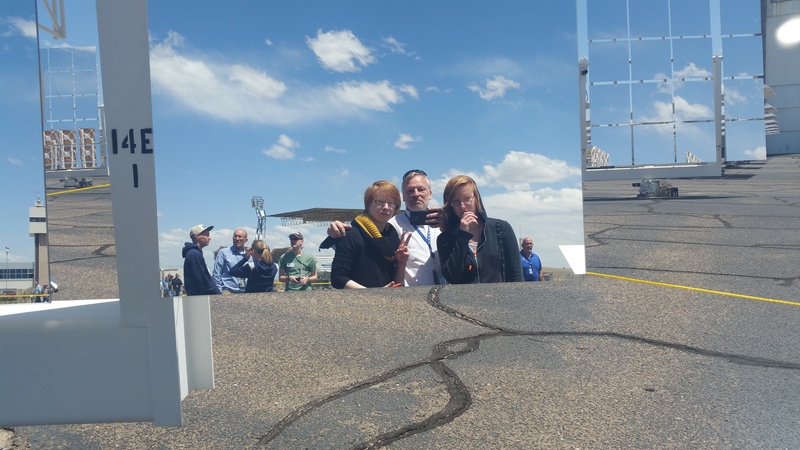 We had a family day not to long ago and Nora, Morgen, and I went and checked out the Solar Tower. Pretty interesting. They use molten salt to transfer and store the energy. Here we are reflected in one of the many many mirrors. Did you know that our best view of pluto right now is this? However, in July of 2015 the New Horizons probe will do a close pass of not only Pluto but it’s currently known 4 moons. 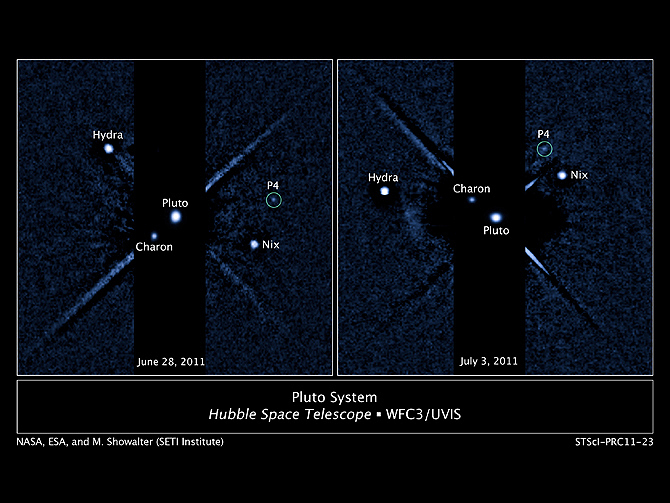 Did you even know Pluto had 4 moons? So, in just under 4 years we will finally get up close and personal views of our farthest ex-planet. To me Pluto will always be the 9th planet, and anyone who says different can bite me. Anyhow. It’ll be interesting to see what Pluto truly looks like. And Charon, Hydra, Nix, and whatever the final name of P4 turns out to be. 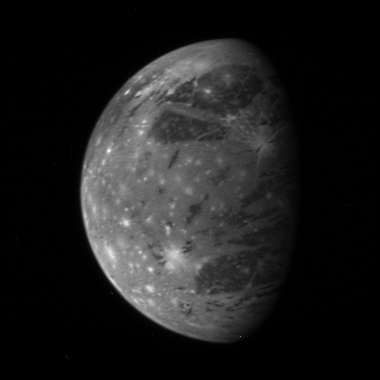 Maybe like Ganymede. Smooth and ice covered. Or maybe like Mercury. A crater covered ball. 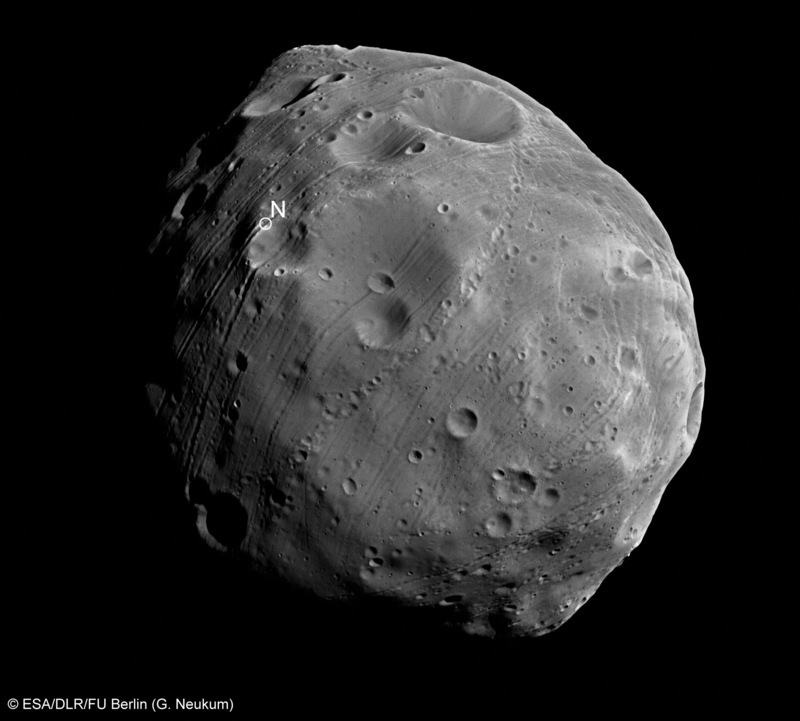 Or maybe it’ll turn out to be nothing but a potato shaped blob like Deimos. Which would mean it really isn’t a planet. That would be a sad day. I ran across this youtube video talking about the Hubble Deep Field images. It’s enough to make a person feel pretty tiny. Strangely enough, I find it is comforting to know that we are such a small part of such a large thing though. I’ve posted the pictures here in the past in an article called Nerd Alert. This is a video talking about the two pictures. Between Sept 2003 and January of 2004 the Hubble Space Telescope looked at a very small piece of the sky, an area roughly 1mm x 1mm at arms length. This constitutes roughly 1/13,000,000 of the sky. In this tiny little piece of sky, which was picked because it’s one of the darkest and thought to be fairly empty, well, it turned out there was over 10,000 galaxies in this empty little piece of sky. Yes, 10,000 Galaxies. So, let’s do a bit of math for fun. Galaxies in Deep Field x area of sky x number of stars per galaxy. 10,000 x 13,000,000 x 100,000,000,000 = 13,000,000,000,000,000,000,000 stars. That’s a 13 followed by 21 zeros. So, if we say the odds of life evolving around a star as 1 in a Trillion. Well, that means there are roughly 13 Billion stars with life around them. If we say the universe is 14 billion years old (current thinking) then after the big bang we let things cool for a billion years or so and then we get one star with life somewhere in our universe every year since. That’s a lot of theoretical life out here. 13 Billion stars worth. Now, around just our little G type star scientists have cataloged over 2 Million distinctly different species. However the estimates are anywhere from 5 million to 10 million different species on Earth. So, we take the middle ground of 5 million times 13 Billion and my head starts to hurt with the possibilities. Update: All this is because a buddy asked me the other day what the name of that “dark space hubble project” was. I might need to get out more. As most who know me know, I’m working with the Navy on a project called NPOESS, or the National Polar orbiting Operational Environmental Satellite System. This was supposed to be a fairly long term stable position, which is why I moved over from eHPC to the NPP/NPOESS team. NPP stands for the NPOESS Preliminary Project. Well, like any good government project it’s been fraught with politics, budget overruns, inefficiencies, etc. 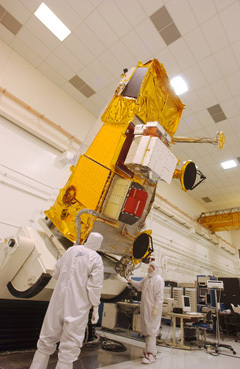 In fact the launch of the NPP satellite has been delayed again from January 2011 to November 2011 because the primary sensor released the magical blue smoke during a power up test. The original launch date was 2006, so you can see there’s been some serious delays. Anyhow. Spaceflight Now has an article discussing NPOESS. Today the White House is announcing that NOAA and the Air Force would no longer continue to jointly procure the polar-orbiting satellite system called NPOESS,” the Office of Science and Technology Policy’s budget summary stated. I’m not sure how this is going to effect my contract, but I’m pretty sure it’s going to do something. I suppose the title of the article says it all. Anyhow, we’ll see how it plays out.I’m betting we’ll continue with the NPP portion of the program at least. Which is what I”m actually working on currently, getting ready for the full project later. So, for now it’s continue working as normal. No worries, no panic, no resume.com. So why the post? In case anyone runs across the article and knows what I’ve been working on, they won’t think “Oh Crap!”. Nah, things are what they are. Having this happen wasn’t a big surprise. FYI I found an article about the Maud expedition on the web. I’ll try to do a quick summary on the paper next week for fun. As some of you who know me know, I don’t believe most of the hype and alarmism over Anthropogenic Global Warming. This means “Man Made” global warming. The more I research and learn the more I find doubt in the whole “Man Made/CO2” cause. Looking at temperature graphs over the last few thousand years shows heating and cooling of the earth. This is a given. How much variability and what is the cause? Now those are hotly contested items. In my parsing through the internet on the subject, I ran across an interesting site by Joanne Nova who has written a small book called “The Skeptics Handbook” and it’s not what you think at first. It’s not a a lot of debate over niddly statistical methods, arguing over this or that, etc. It’s not bad really. Which was kind of surprising. Whether you believe the hype or not, knowing both sides of the debate is a good thing to do. Here is the crux of the question.. I like the simplicity of the question. It really cuts to the core of the whole issue. Pollution is bad. It’s silly to pollute where you live. Computer Models of the environment are examples of chaotic systems. They can show anything or nothing with little difference between them. 99.9999% of the population once thought the earth was flat. Now only a few hundred years later 99.9999% think it round. Just a comment on popular opinions. Spending Billions or even Trillions of dollars to fix a problem that may not be what we think is WRONG. We need to understand first. Spending Billions or even Trillions of dollars to fix problems we KNOW is much better money spent. Cancer, hunger, Malaria, and Aids are just a few of the issues that need fixing and need it badly. Go Bill and Malinda!!! You too Warren Buffet. If you don’t know what I mean then you need to read about the Gates Foundation. They are doing things right when it comes to solving the worlds problems. Instead of crying about CO2 polluting countries. Help them develop cleaner, better, more efficient technologies. Don’t try to throttle them. We went through our polluting phase. Just look at the dark gray, coal sooted buildings in Edinburgh. Help the developing countries build their infrastructures with what we have learned without having to do it the hard way. Okay. Enough about this. We all have our opinions. This is mine. Right, wrong, or indifferent. We were surprised today by an announcement that there would be a question and answer session in the conference room with Nobel Laureate Dr. John Nash. Dr Nash became famous to most people outside of academia through the movie “A Beautiful Mind” which was loosely based on his life. Dr. Nash is now 80 years old and, as may be expected, a bit of an introvert. He was diagnosed as a Paranoid Schizophrenic back in 1959 and has been hospitalized multiple times for the disease. He takes no medication for the condition and just uses his intellect to keep the paranoia and delusions at bay. The government needs to be seen to do something. It needs to have the appearance of knowing how to solve the problem. Just the appearance of knowing how to solve it will improve the perspective of the American public. Which will help improve the economy. So, they can’t do nothing, they must appear to be doing something. Which will help. After hearing folks ask questions about the economy, his mental illness, the movie, wall street algorithms, etc I decided to ask him what interested him now. After years of pursuing Differential Equations, game theories, economics, what did he find interesting now? He now likes to read about other sciences, especially Astronomy. Today we had a photographer from the University of Edinburgh out here at the Advanced Computing Center to take some video and pictures. Yes, yours truly is now a film star, ya, not! However I am in the new videos. Anyhow, we were chatting about some of the things he’s taken pictures of and somehow the conversation ended up about how he had taken pictures of Peter Higgs, who had a Yucca tree in his office and that how when it reached the ceiling he would retire. Momentary pause for consideration. Uhm. Peter Higgs the theoretical physicist? You know, like the one the God Particle is named after? Higg’s boson, Higg’s field. That Peter Higgs? Yep. Sure as sin. It seems that Peter Higgs is an Emeritis Professor at the University of Edinburgh. He lives here in New Town. I just watched a youtube video about him where he talks about walking past the home where James Clerk Maxwell was born while on his daily strolls. This is another place I am going to need to go check out, just to say I’ve been there. Nerd Nirvana. I know, if you’re not a geek you have no idea of what I’m talking about. That’s okay. I do. Put it this way. The $6,000,000,000 CERN Large Hadron Collider is being used to try and find proof of this particle. Yep, a $6 Billion dollar machine. Anyhow. Needless to say, I’m impressed by this fellow Peter Higgs. It would be fascinating to meet this guy and just have a cup of coffee and chat.